This weeks weather was on the rainy side getting showers most every day but they came and went quickly. 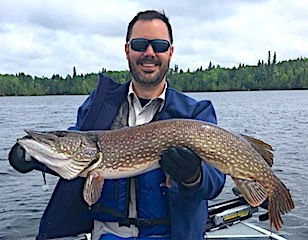 It seemed as if the constant change in weather brought the big toothy critters out to play as our guests did well catching Big Northern Pike & Muskie. Long time guest Carl Quertermus returned with Tony & Margie Chambers for their second time. First day Carl & Tony had a quantity day catching a lot of Northern Pike. 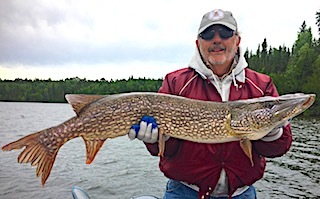 2nd day the T-storms & high winds restricted their fishing time but still caught 20 Pike. 3rd day had them catching 18 Northern Pike and Carl Landed 2 Muskie 33 & 34-inches with the Blue & Silver Syclops being the hot ticket. 4th day was super catching 34 Northern Pike, Carl catching a 34 Pike and 34 & 35-inch Muskie on a whopper plopper. 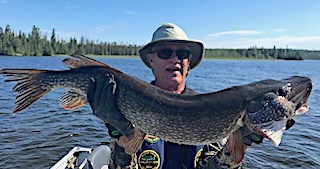 5th day they had another super day catching Many Northern Pike and Tony got the prize as he landed a 40-inch Trophy Northern Pike that was very heavy estimating it to weigh about 20 pounds. 6th day was very special for Tony and Margie as they celebrated their 47th wedding anniversary and we were honored that they choose to stay with us at Fireside Lodge. 7th day they did terrific catching exactly 50 Northern Pike with a lot 30+inches, plus Tony did it again catching a very large 38.5-inch Pike. 8th and final day they ended up with 20 nice Northern Pike which concluded a great fishing trip. All left wishing there were just a few more days of fishing. Over 20-year guest Paul Letourneau from North Oaks, MN returned with his nephew Nick from Maple Grove, MN for his second trip. 1st day they caught some Northern Pike, 20 really nice Smallmouth Bass and Nick caught his first ever Lake Trout. 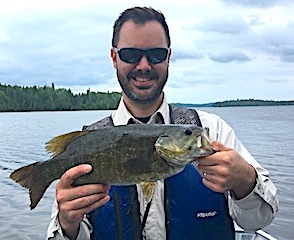 2nd day was fabulous Smallmouth Fishing, catching over 40 with most 16.5 to 18-inches and multiple Smallmouth over 18-inches. 3rd day was one of those more challenging days fishing. 4th day they portaged to Booger Lake and had a fabulous time catching 75+ Northern Pike. 5th day was a great day catching a mix, landing over 20 Smallmouth Bass 7 Northern Pike and 3 Muskie, Paul with a nice Tiger Muskie and Nick landed two-barred Muskie. 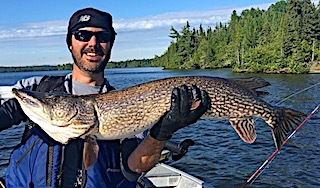 6th and final day was all about hunting big fish and they finished strong catching a 37, 37.5 and 38.5-inch Northern Pike, which was a great way to end the trip. Paul & Nick had a fantastic time and Paul will be retuning in August with good friend Spencer and hopefully his son Michael. Third time guest Charles Row from Maitland, FL returning at the young age of 92 with good friend John Puckett from Blue Ridge, GA for his first experience at Fireside Lodge. 1st day these two caught 27 Smallmouth Bass with Charlie landing a big 17.75-incher and John catching a Trophy measuring right at 18-inches. 2nd day weathered them in with T-storms & high winds. 3rd day brought better weather and great fishing as these two caught 26 Smallmouth Bass, Charles landing a very fat 17-incher and John catch a whopper Trophy Smallmouth Bass measuring 19-inches. 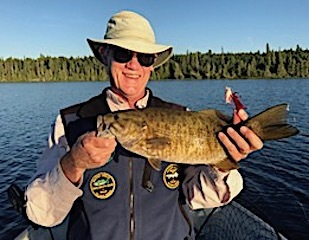 4th day they had another good day catching 23 Smallmouth Bass with Charles biggest at 17.5-inches and John caught his 3rd trophy in 3 days landing a beauty Smallie measuring 18-inches. 5th and final day was all about quality as they caught 18 Smallmouth Bass with Charles catching 5 17 to 17.75-inches and John caught 2 more trophies over 18-inches and two more over 17-inches. Both left having a great trip and hope to return. Long time guests from Tucker, Georgia Mike & Linda Lapresi were glad to be back to enjoy our wonderful Smallmouth Bass Fishery. The 1st time they came to Fireside Lodge was 21-years ago with their two boys who are now married with children. 1st day weathered in with T-storms & high winds had them catching a few Smallmouth before the storm. 2nd day was great as the caught many Smallmouth Bass all but a few were big, Mike fly fishing using surface poppers and Linda caught an 18” Trophy using her favorite, a Tiny Torpedo. 3rd day had them catching 30+ nice Smallmouth Bass during the day and catching 25 more after supper totaling 55 for the entire day. They said most were bigger fish 16- 17-inches. 4th day was another great day as they caught over 40 Smallmouth Bass, all again being bigger fish. 5th and final day the weather was not on their side but they still managed over a half-day fishing catching more nice Smallmouth Bass. Steve Dentinger from Elgin, IL with vey good friend Ralph Fruehauf from Tomball, TX returned for their 4th time. These two are true fishing buddies always arriving ready to make a new set of memories. 1st three days these two caught a good number of Northern Pike with 2 in the 34-35-inch range, several Smallmouth Bass and Ralph caught a Muskie on his favorite lure the blue and silver Blue Fox Spinner. Next day was great especially for Steve while fishing for Smallmouth Bass with 8lb test line he hooked into a monster fish that had him all over the place, and with the excellent use of the cradle by Ralph, managed to land a Beautiful Trophy Muskie measuring in at 45-inches. Both were very excited with the event as they were telling the story. Another day these two caught over 20 Northern Pike each catching a 39” very heavy Pike. 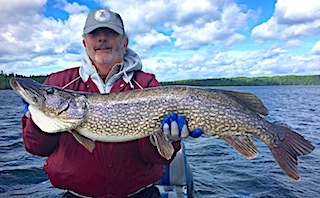 Last day was spent fighting more rain and high winds catching some nice Northern Pike with Ralph landing a big fat 38.5-inch Pike. Les Schalla from Sault Lake City, UT returned for his 2nd year in a row bringing 4 other fishing buddies Jim Parker, Len Mazz, Tom Kramer from Palatine, IL, and Tom Kuppell from Clearwater, FL. This group has fished faithfully together for 35-years despite some members being relocated to other parts of the USA. What a great way to reconnect with good friends and family. 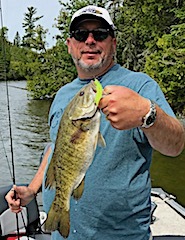 After a day of getting to know the waters and catching a few fish, days 2 and 3 had them catching both Northern Pike and Smallmouth Bass and some were following Ralph’s (above) lead and purchased Blue Fox Spinners in hopes of replicating their success with bigger fish. This did not happen for them but they sure had fun trying. Their special annual fishing time together showed through every evening at the supper table with discussion and laughter. Mark Donovan, Chicago, IL returned with first time guests Joe Herdegen, Father and son Kenny & Jordon Calta, Lake Villa, IL and Sam Santiemmo from Itasca, IL. 1st day Mark, Sam & Joe caught 15 Northern Pike and 27 Smallmouth Bass, with Kenny & Jordan catching about 20 fish and Jordan had the hot hand with Northern Pike using a white spinner bait. Second day was a fabulous day Smallmouth Bass fishing as each boat caught over 50 Smallmouth Bass totaling over 100, most being 15 to 18-inches with Sam, Joe, and Jordan all catching a Master Anglers Award Trophy 18-18.5-inches and Jordon also caught a very nice 33-inch Muskie. 3rd and final day ended with another stellar Smallmouth Bass day catching over 50 before supper as a group. All left having a short but great trip and hope to return in the near future.